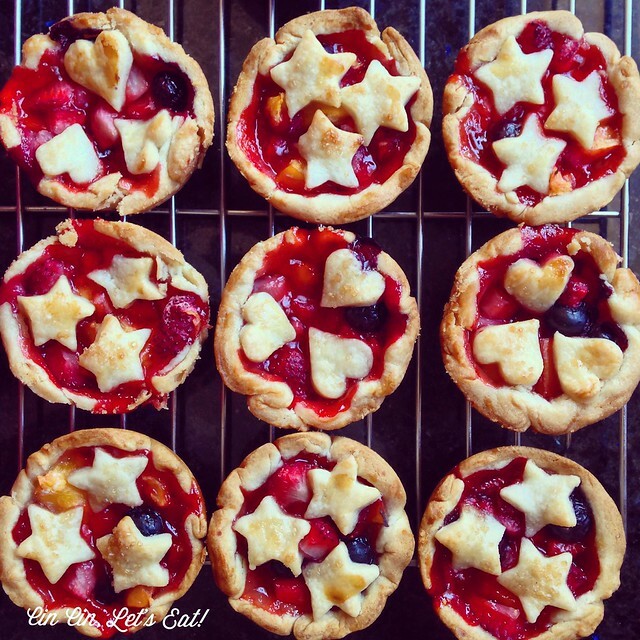 Mini Berry Pies [recipe] – Cin Cin, Let's Eat! I absolutely love pies! I used to be all about banana cream pies but lately I am really into fruit pies, especially ones that are filled with sweet summer berries. I did a post on these cute miniature apple pies last year, so this post is very similar, just with different fillings. 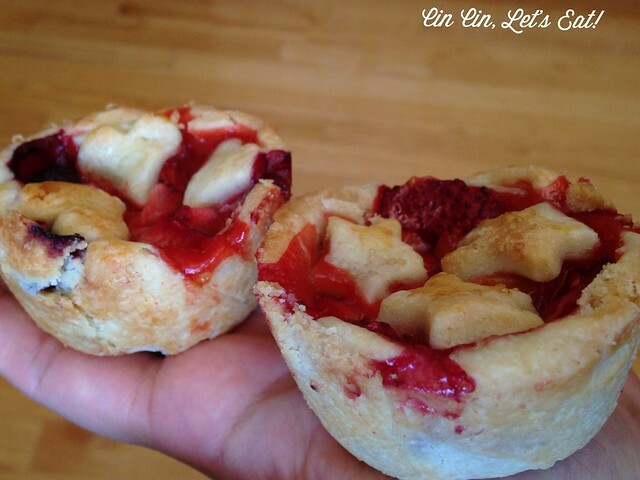 I love miniature pies because they are portable, just perfect for bag lunch and picnics. No forks and knives required and no mess! 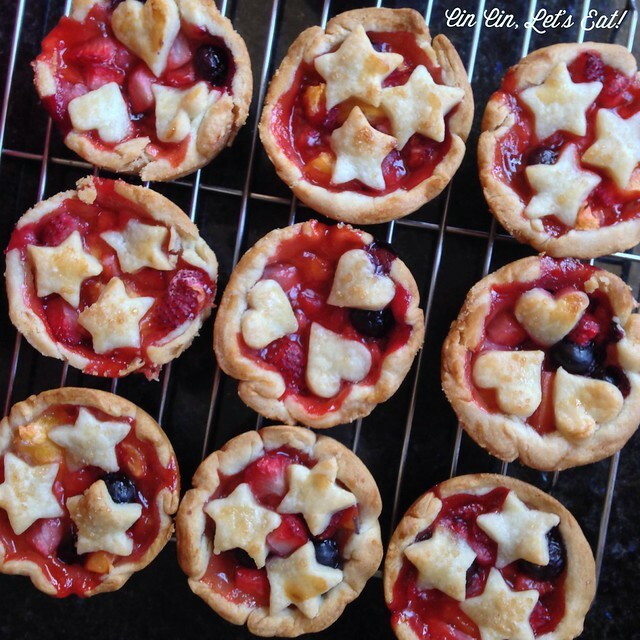 And how cute are the hearts and stars on top? 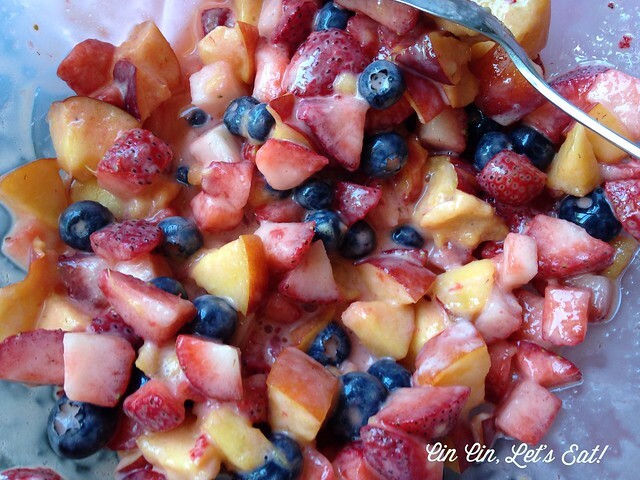 In a bowl, toss together the berries, sugar, cornstarch, vanilla, lemon, and salt. 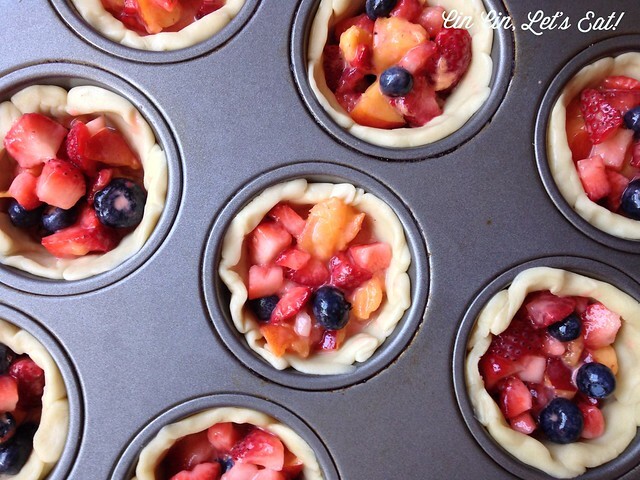 Using a 4″ round cutter (or a bowl), cut out 6 rounds on the pie dough. 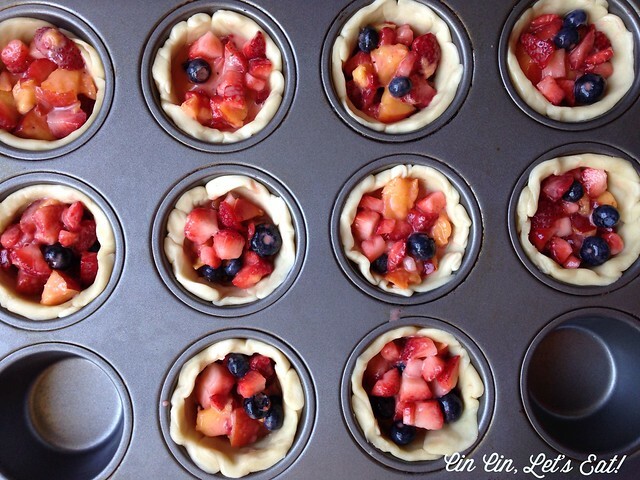 Fit each round into a slot in the cupcake/muffin tin. Spoon in the berry filling, divide evenly into each slot. Don’t overfill as the juices will rise and bubble, and overflow bubbling juice makes such a mess! 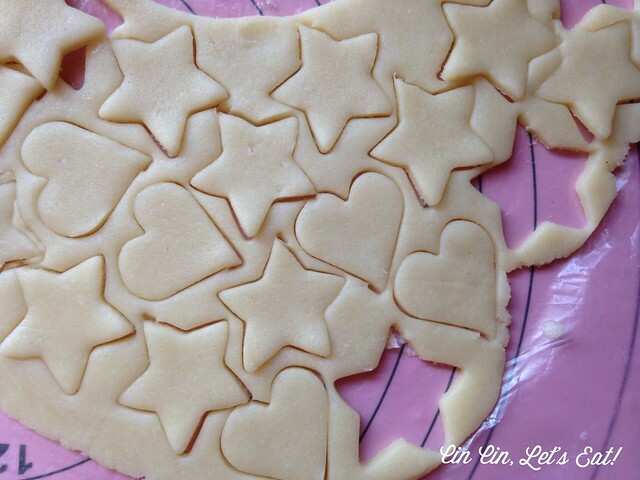 Using cookie cutters, cut out shapes like hearts and stars with the remaining pie dough. Place them on top of each pies. Brush the dough with some cream or egg wash, sprinkle with the turbinado sugar. Bake for 30 minutes or until the top is golden brown and the filling is bubbling. Once the pies are done, leave them in the pan for 15 minutes until slightly cooled, then remove them to cool further on a cooling rack. If the pies are stuck because the syrup somehow glue the pie and the tin together, insert a toothpick or a knife along the edge and wiggle it slightly until the pie is loose. These can be stored in room-temperature. I like to refrigerate them as they keep longer. Serve them at room temperature but I think they are best when they are slightly toasted (and a la mode or with a little bit of sweet whipped cream*). *I learned an easy way to make whipped cream without a mixer or whisk. Place heavy cream, sugar, and vanilla bean paste in a mason jar. Tighten the lid and shake away. It’s a great workout and only takes a couple of minutes to make delicious whipped cream topping for these pies. Note: If you have any leftover berry filling and/or tiny bits of pie crust, put the filling in a ramekin, top with the bits of pie crust or make a quick oatmeal topping (oats, flour, butter) and bake alongside with the pies. Got yourself a little fruit crumble to snack on! I threw in a nectarine as well. This looks delicious! 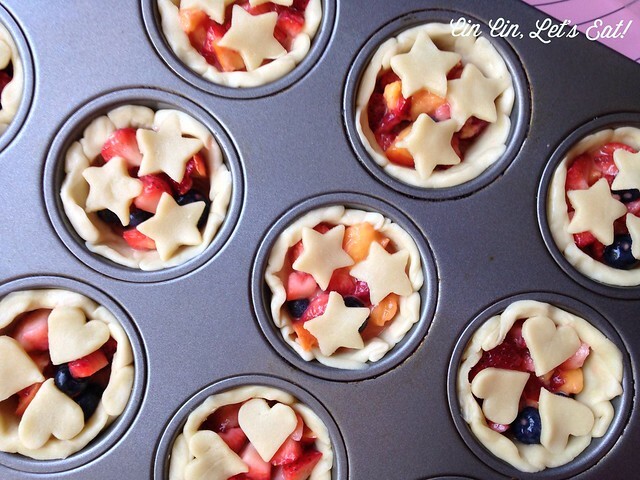 Beautiful pies! so cute! lovely photos, too.